In my brief tenure as part-owner of a home, I've found it dishearteningly true that houses are black holes of time and money. Routine maintenance reveals expensive problems, small jobs turn into big ones, and bathroom remodels can easily cost $50,000. So it's always refreshing to begin a project with a budget in mind, stick to the budget, and be pleasantly surprised by the results. (That sounds like such a simple thing.) Though I'm sure it's easy for a garden budget to spend wildly out of control, the garden in our front yard was one of those rare projects wherein a shoestring budget yields big results. So far, the planning and elbow grease in the front yard has been the biggest bang for our homeowning buck. One day, while a disapproving husband was out of town, I dug up the pebbles and pavers that had covered our cracked walkway and planned the garden layout and vegetation. I looked through all the garden images I've saved, and drew out a landscape plan to figure how many plants to buy. 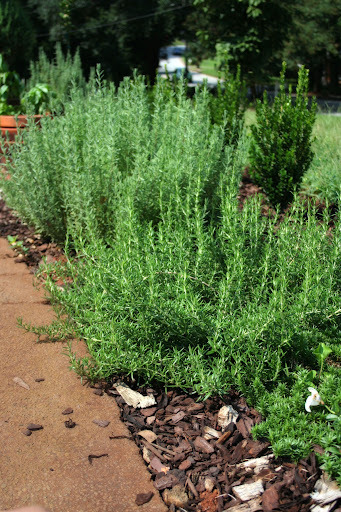 I love a cool, green garden with a neat hedge and low, herbal groundcover, so I chose small boxwood plants that will eventually grow into a hedge, and used these to hem a mix of French lavender, creeping rosemary, and purple creeping phlox. We've had great luck with all of these in other parts of the yard, so I knew they wouldn't be too much maintenance for me to handle. 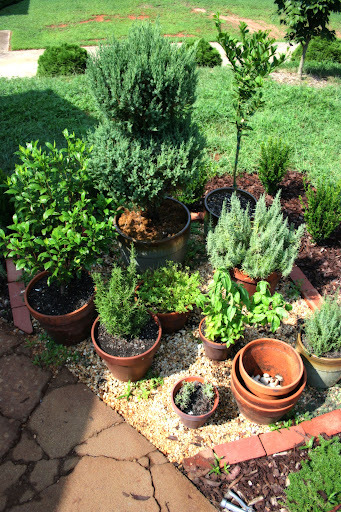 I spent about $180 on small boxwoods, lavender, rosemary, and good soil. I spent three full days digging up the grass flanking the walkway, turning the dirt and mixing in good soil, and carefully edging the grass in a straight line. Neither Allen or I is crazy about the way our walkway meanders haphazardly toward the house, so I planned the garden to make up the difference - its straight, geometric boundaries encompass the curved walkway, instead of allowing the walkway to define the yard. I laid out the boxwoods evenly before removing each one to dig a hole, and then I planted it. Then I infilled with our herbs and groundcover. And I surprised Allen upon his return home by letting him stain the concrete walkway! We found some free cedar mulch and some bricks, and recycled some of the pebbles to cover an area for potted plants. I always stain terra-cotta pots with walnut-colored wood stain, spray on a coat of polyurethane, and then let them fade and peel. We also planted an area, on the other side of the walk, for tomatoes and strawberries, which have given us plenty to eat, and also taught me to hate squirrels. Before, the walkway to our front porch was difficult to walk on, tacky, and plain. 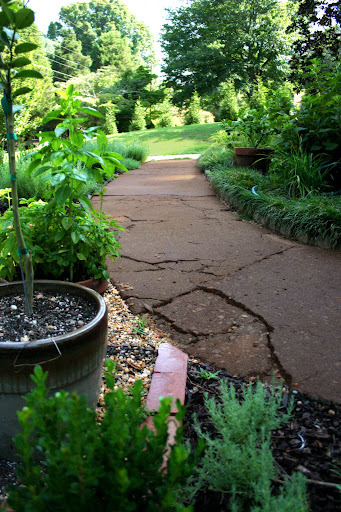 Now, it's a simple, utilitarian (let's call the cracks "rustic") walkway lined with beautiful things. And with plants, materials, and concrete stain, we're out about $240. It's really beautiful - lots of texture, and contrasting shapes - and I LOVE your planters! I wish my garden looked anything close to that.